Every Fall, the colors of maroon and orange not only describes the changing leaves as one drives through the Blue Ridge Mountains to Blacksburg, VA, but portrays the sea of color one will see at Lane Stadium each Saturday for Hokie games. That peaceful scene becomes electric outside the stadium as fans tailgate around this beautiful campus. Once inside the stadium, don’t wish for another peaceful moment as Lane Stadium is known in college football as being one of the loudest stadiums in the country, starting with the playing of Metallica’s “Enter Sandman” before the start of the game. The history of football at Virginia Tech dates back to the first half of the 20th century as the team played at Miles Stadium. However, by the early 1960s, Stuart Cassell proposed a plan to build a new stadiums as Miles Stadium needed to be replaced due to its size and location on campus. After raising enough money for a new stadium, construction began in April 1964. The new stadium was named after Edward H. Lane, who helped raise $3 million for the project. Although the stadium was not yet complete, the Hokies played their first game at Lane Stadium on October 2, 1965 against William and Mary. Construction of the $3.5 million stadium was completed by 1968 and seated 35,050 fans. Grandstands were on both sides of the gridiron and a three tier press box was atop the west grandstand. With growing support for the team, additional seating was added to the east stands in 1980 bringing the capacity to 52,500. The Hokies played under lights for the first time in 1982 against state rival, the Virginia Cavaliers. A new scoreboard was installed in the north endzone prior to the start of the 1991 season. Over the past decade, fans attending games have seen many additions to Lane Stadium. Prior to the 1999 season, 2,000 seats were constructed on the north endzone and the following year a new video/scoreboard, known as Hokievision was added. Perhaps the biggest addition to Lane Stadium was completed prior to the 2003 season. A two tier grandstand featuring 11,000 seats, 15 luxury suites and a new visitor’s locker room was added. After the 2003 season, Virginia Tech began its latest expansion, this time on the west side of the stadium. The $52.5 million expansion included 23 luxury suites, a new pressbox and club seating. 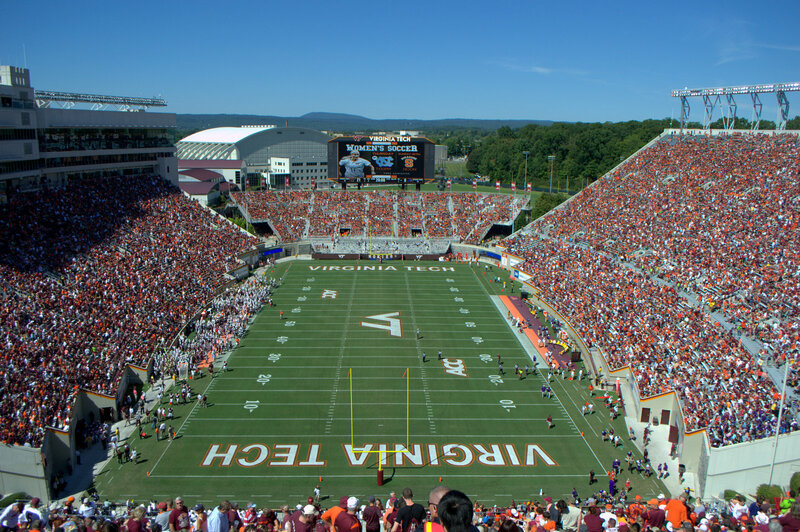 The addition increased Lane Stadium’s seating capacity to 66,233. Before the start of the 2013 season a new 108 feet long HD video/scoreboard was installed. The Hokies have one of the best home-field advantages in college football as Lane Stadium is known as having one of the loudest atmospheres in football.